At lunch time, the Swagat branch on South Abel in Milpitas offers a lunch buffet, bargain-priced at only $6.94 per person. Overall the selection is quite good here, but only a few South Indian items are on the buffet. Not all the dishes were identified with labels. I almost decided to forego the all-you-can-eat and just order a dosa, but unlike the other buffets I've tried, no other customers had dosas or ala carte items. On my first trip to the buffet for the array shown in the photo below, I picked out the dishes that seemed like they were South Indian. The sambar was richly flavored and had chunks of zucchini in it. But I also found onion skins and a piece of root end. The curry next to it in the small dish above the spoon was oversalted but otherwise very delicious, made with bottle gourd, and extremely hot. But tasting of butter and cream, it seemed like more of the North. The pea biryani that was quite good with nice fragrance, lively spicing and beautiful long grains, though I don't know if it's representative of a North or South style. The kurma on the plate was a heartier tomato red curry and less refined style with more kinds of vegetables in it, such as zucchini and eggplant. The dal in the small dish on top of the plate was complex and extremely fiery in spicing. The idli was from a freshly made tray and was just okay, not tough, but not airy and light either. The papad was overbrowned and pretty dried out. I used it to taste the chutneys. The coconut chutney had the same beige cast to the color and peanut taste I'd noticed in Sarovar's and didn't taste very fresh. The green mint chutney was very chili-laden and minty but had an artificial preservative taste to it. The tomato chutney didn't taste as canned, but it was rather flat and simple. For the next course I moved North and had a sample of decent tandoori chicken thigh, okay keema mutter, an interesting red-stained pea and fresh mushroom curry, butter-laden chicken makhani with a thin runny sauce, and something made with kidney beans and tomatoes that looked like chili beans. The sauces tended to repeat too much, but nevertheless they hit some solid notes and were good enough that I'd come back for a dinner of North Indian dishes. I didn't try the naan because it was cut into quarters and sitting on the steam table too long. Because I didn't like the three chutneys much, I don't know that I would delve much further into the South Indian side of the menu especially since Tirupathi Bhimas is the next freeway exit down the road. Before leaving, I overheard someone ordering a dosa, but I didn't get to see it. My favorite item of the day was a marvelous kheer, rice pudding, studded with sultanas, noodles and tapioca pearl. The round grains were soft and just starting to break up in the richly concentrated thick cream. It was only lightly sweet in balance with the subtle use of cardamon and rosewater. I would return just for this. As is often the problem with buffets, proper serving temperature was an issue. 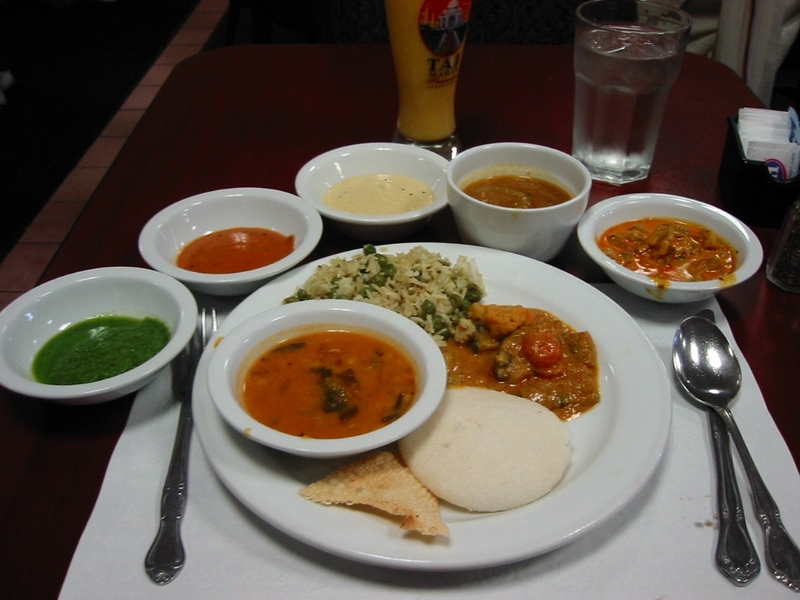 While business was brisk and food was replenished often, nothing I tried was thermally hot except the sambar. Service was good with water refilled often and the many plates and dishes were cleared away for the next round. This was very good value for a lunch buffet. P.S. A banner over the salad bar announced that Swagat was now open in Las Vegas.